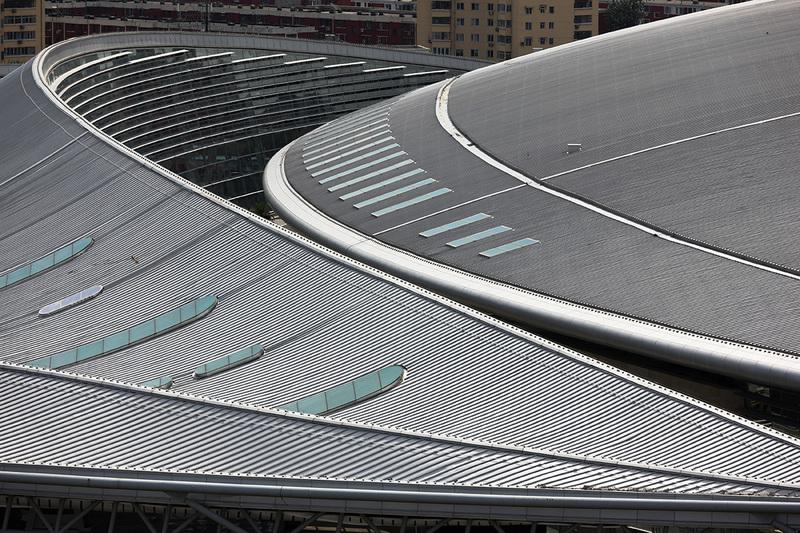 Beijing South Railway Station, the Chinese capital’s massive high-speed rail terminus and winner of a 2009 RIBA International Award, turns 10 years old today. 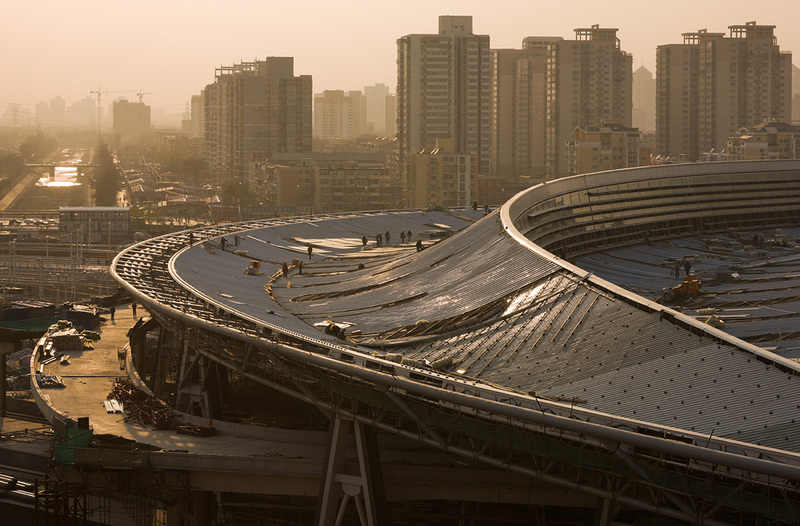 Unveiled a week ahead of the 2008 Summer Olympics, Beijing South was the largest rail station in Asia upon opening – eclipsing even Herzog and de Meuron’s “Bird’s Nest” Olympic stadium in size. Designed by Farrells, the station initially served as the terminus of the then-new Beijing–Tianjin intercity link. With a maximum operating speed of 350 kph, the line overtook France’s TGV as the world’s fastest railway and marked the beginning of an explosive period of high-speed rail construction in mainland China. China’s high-speed rail network spent years in planning. The country had long grappled with insufficient rail capacity, especially during the notoriously crowded Lunar New Year travel period, when close to 400 million Chinese people visit their hometowns annually in the world’s largest human migration. Since the 1990s, Chinese railway authorities had debated the way forward. A new minister of railways took office in 2003, and in 2004 the blueprint for construction of China’s high-speed network was announced. The first “ultra high-speed” line would connect the northern cities of Beijing and Tianjin before the 2008 Olympics. Construction began with a groundbreaking ceremony on 24 December 2005. 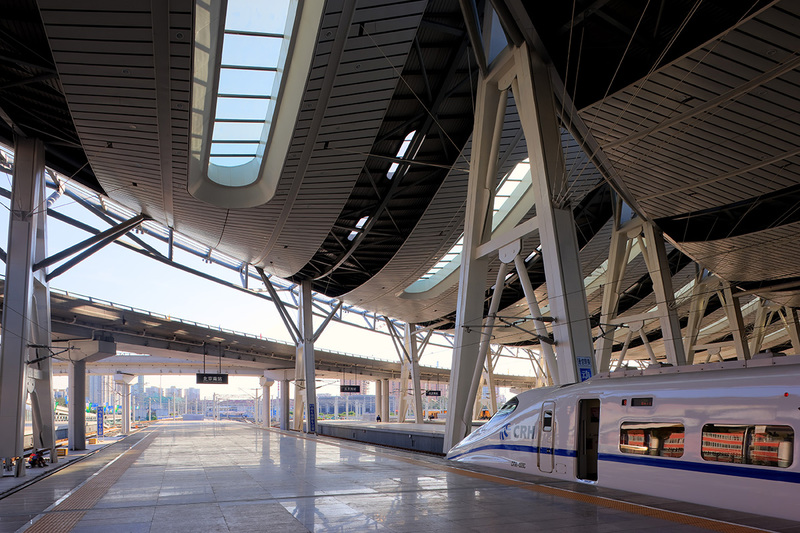 Farrells won an international design competition to design the Beijing terminus of the line and collaborated with a Chinese partner, the Third Railway Survey and Design Institute Group, to deliver the building. Construction began with a groundbreaking ceremony on 24 December 2005. 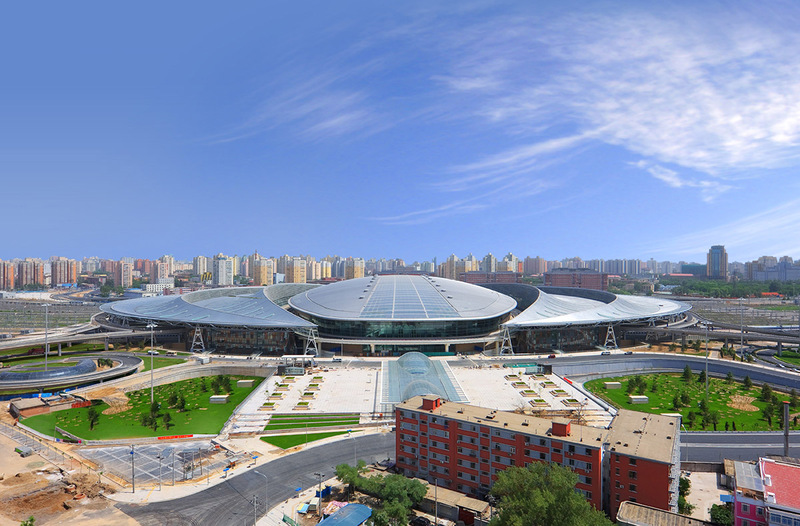 The station’s roof, which Farrells state was inspired by the upturned hip roofs of the nearby Temple of Heaven, is actually composed of three separate sections: a central portion that shelters the main waiting hall, and two side canopies covering the station’s 11 island platforms and two side platforms, which provide a total of 28 intercity platform edges. 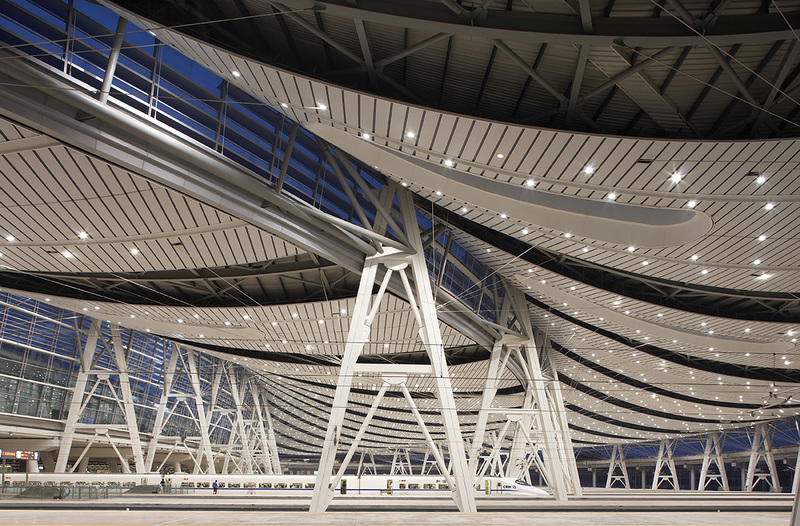 While the side canopies are permeable and open to the outdoors, allowing for natural ventilation, the central roof is fully enclosed for passenger comfort. The central roof includes a 15,000-square-metre skylight, of which about 70 per cent is high solar performance low-e coated glass. The remaining 30 per cent comprises thin-film amorphous silicon photovoltaic cells laminated into insulated glass panels, helping meet part of the station’s electricity requirements. 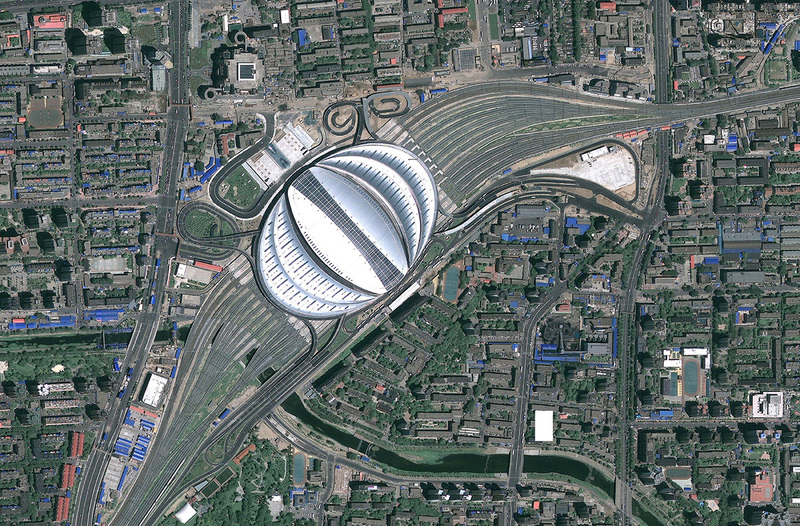 In the last decade alone, China has built a staggering 22,000 km of high-speed track. In slashing the trip between Beijing and Tianjin to a mere 30 minutes, the opening of the new line proved high-speed rail’s potential in China. Months later, the national government announced a massive economic stimulus package. Much of the investment went to infrastructure, especially high-speed rail. In the last decade alone, China has built a staggering 22,000 km of high-speed track in what has been called a nation-building exercise. Beijing South served as a template for the so-called “mega-stations” that are now found in nearly all major Chinese urban centres. 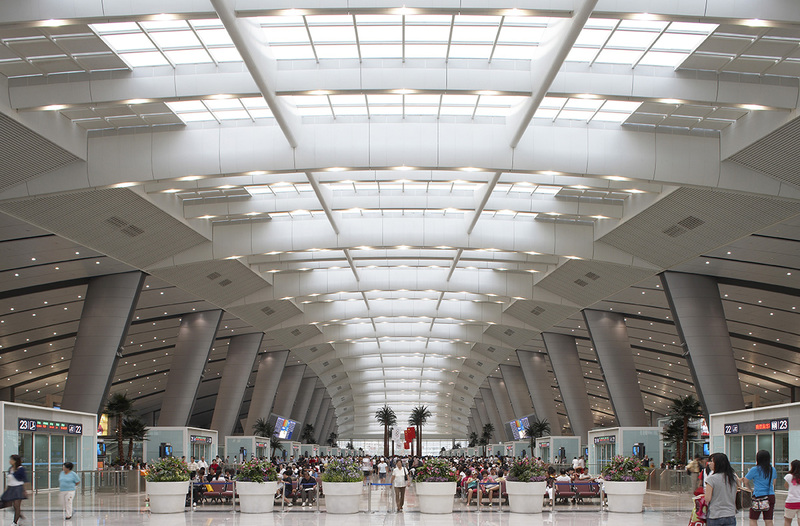 For Farrells, Beijing South was a proving ground for design principles that the firm applied in their subsequent infrastructure work, including Guangzhou South Railway Station, which in 2010 stole the title of Asia’s largest rail hub, as well as the planned high-speed rail terminus in Singapore.